I have been wanting to try to "kopy kat" Sherry and her French wine bottle makeover over at "No Mininmalist Here" blog. by looking closely at hers to see the details. and really you don't SEE the bottle very much. Livingston wine bottle looks quite French-y. so I could have a bottle to work with. Sherry's bottle also had cording at the top and bottom of the bottle so I just got some twine that was close to the color of my burlap. 21" x 12" so I have plenty left to do more bottles in the future. I went to Graphics Fairy website to look for a label to copy. to transfer onto the burlap with a paint pen. I just got a French words off the site (which I have NO IDEA what it means) and selected a font on my computer to have something to copy. Sherry used tracing paper to transfer her writing to the bottle's cover. I tried that, but my burlap was so rough that I could not see the transfer. It would probably work better on a smoother burlap﻿. During the daytime, sometimes I will hold something I want to trace up to the glass window but I was working on this project at night so I used the old "Lamp Under the Glass Coffee Table Trick"...how archaic in this time of Shilouette machines, etc. I thought it would be easier to do the writing before I did the sewing. I put right sides together and sewed a seam in the burlap to make a tube to slip over the bottle. To get rid of the excess burlap in order for the cover to fit close to the top of the bottle, I made darts in the cover. I pulled the pins out as I got to them on the sewing machine. You could also do this part by hand sewing. I was hoping to not have to cut the excess material off to keep it from raveling but it was too fat, so I did trim off the excess material from the darts. The easiest part of the project: using a glue gun to attach some twine around the top of the bottle. 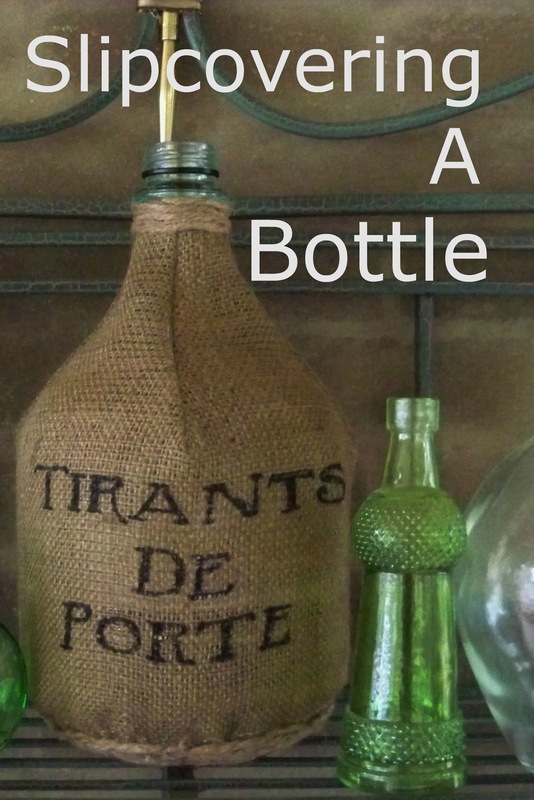 Use your glue gun to attach the bottom of the burlap cover to the bottle. I did it in sections so it wouldn't be too much burlap on any one side...north, south, east, west...then northeast, southwest, etc. Don't make the mistake I did and pull it down too tight...that made the writing "droop" in the finished product. I stood the bottle up in my box of glue gun supplies to keep it steady and easier to work with. attaching twine to the bottom of the bottle. when he bottle was standing up. with twine if you would like to...I decided it wouldn't show. Another tip: don't be lazy like me...take the label OFF the bottle before covering it. I didn't think it would show through but it does if you look close. More empty bottles for more slipcovers. and work to get my darts more uniform. brown paint if it looks "too new" for you. nice job, love it!! wonderful old world look! Such a cool project. It turned out awesome. I love your lamp under the glass coffee table trick. Never saw it done before. I love this look and burlap. Wow, you did a FABULOUS job of recreating my antique bottle!! I love it. Thank you so much for the mention and for joining my party. Would you mind if I featured this project on my blog? I forgot to mention that the saying on your bottle translates to "pulling door" in English. I am now following. it turned out really well!!! and thank you for taking the time to take pictures while making it. Great job!!! Fun project to make! Saw you on No Minimalist. Great project! It looks really authentic! I love your burlap covered bottle! So creative! Very cool project. Thanks to the tutorial, I realized this is something I could try. great tutorial and great copy kat. How fun! My dad drinks wine from those huge jugs all the time. I may have to take one. You did a great job! I love the wording on it (whatever it says) :) and the way you made it fit the bottle so well. Visiting from Debbiedoo's party and am now following. You did a great job! And thanks for the tutorial. I was wondering how to get the burlap to fit the shape. You done good girl! I love how that turned out. Thanks for sharing at the newbie party. This is so very clever. My husband would actually love this idea. Ha, I'm seeing this on your blog before Sherri's! You did a great job. Oh, I'd love to have one of these. Love this! Burlap is awesome...so fun to do projects with.